BEIRUT (AP) — Both Syria's government and its opposition welcomed the Turkey-Russia deal declaring a de-militarized zone around the major rebel stronghold Idlib, saying Tuesday the agreement stemmed more bloodshed. Still, the government vowed it will keep up its campaign against "terrorism," either militarily or with reconciliation deals. Syria's armed opposition said the Idlib arrangement is a victory for its resistance and will improve its standing after crushing military defeats in recent months elsewhere in the country. Idlib is home to 3 million residents and around 60,000 fighters, including some of the world's most radical. Some estimates put the number of radical fighters at about 10,000 who are in control of nearly 70 percent of the enclave. The deal aims to end their presence in Idlib. Some of the militants called supporters of the deal "traitors," warning that it is likely to end with indiscriminate violence. A pro-Syrian government newspaper, Al-Watan, reported Tuesday that the agreement envisions three stages ending with the government's authority restored in Idlib. 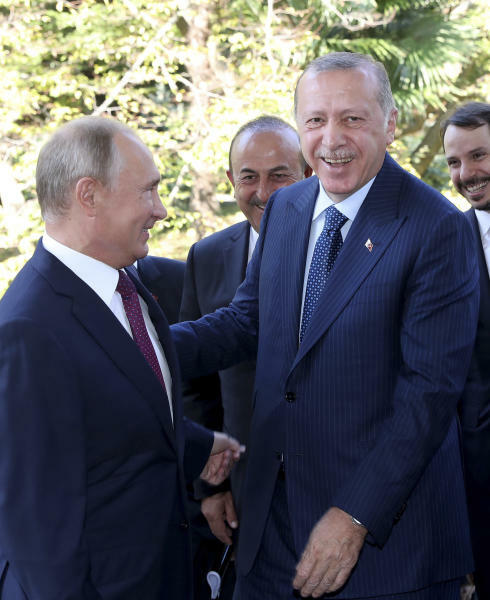 In declaring the agreement Monday, the Russian and Turkish leaders didn't mention restoring the Syrian government's authority in Idlib. Such a proposition threatens to undermine the agreement, which was put in place in the absence of a political solution. Turkey's Foreign Minister Mevlut Cavusoglu said Tuesday the arrangement ensures the continuity of Syria's moderate opposition. He said it would allow civilians and Turkey-backed anti-government rebels to remain in the demilitarized zone and "retain light arms." Iran's U.N. Ambassador Gholamali Khoshroo called the Russia-Turkey agreement on Idlib the "right step" toward fighting terrorism and restoring peace to Syria without hurting civilians. Idlib is home to some of the government's staunchest opponents, including civilians and insurgents. Insurgent groups include al-Qaida-linked Hayat Tahrir al-Sham — or Levant Liberation Committee — the Turkistan Islamic Party and Horas al-Din, or Guardians of Religion. The agency also said the deal was a "follow-up" to previous "de-escalation" agreements which resulted in opposition areas "being handed over" to the government. Abu Yaqzan al-Masri, a religious judge affiliated with HTS, said the coming days will be "full of surprises" and warned against the rebels giving up their weapons. He said some will attempt to spark infighting to rid the area of jihadists and help the Turkey-Russia deal. An HTS spokesman said the judge's view doesn't represent the political position of the group. Al-Masri, in a statement posted on social media, called such trouble makers "traitors and agents." "Those who ask you to give up your weapons should be the first to fight," he said.